The house is within easy reach of the popular working harbour of Falmouth, the Helford river estuary, the SW Coastal path, the Lizard Peninsula and some of the most stunning and visited gardens in Cornwall. 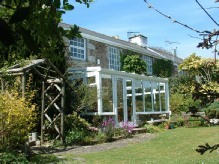 Trebah, Glendurgan, and Penjerrick are within easy walking distance of the house as are many of the local beaches. For those who are walking the South West Coast Path Mawnan Smith offers an excellent base for the Helford , Lizard and Falmouth section. We can offer a pick up and drop off service from Helford Passage or other points along the path. Gold Martin offers a unique holiday setting for those who enjoy the countryside, walking, photography and painting or perhaps just a little peace and tranquility. Whether you stay for one night or longer a warm welcome awaits you ensuring that your stay in Cornwall is a memorable one. 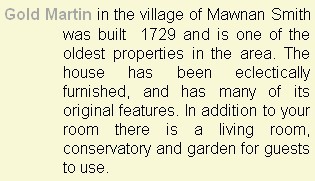 Mawnan Smith is also a good base for golfers, divers, anglers, wreck fishing, boat hire and boat trips around South West Cornwall.